Home / Breeders' Cup / Breeders’ Cup 2017 – Crushing The Cup! Breeders’ Cup #34 is now in the history books and what another fantastic weekend of world class racing conducted on that quirky Del Mar oval by the sea. If you like long shots (and we do), this year’s Breeders’ Cup featured a continuous parade of bombers including some of the extraordinary kind. Perhaps the greatest feature of the Super Screener is the great track record produced over the years in isolating from the many long shots in these Breeders’ Cup races, those that have the best shot to hit the Superfecta. This year was no exception and the Super Screener delivered once again on that front. Below is a chart that captures the outcomes of horses we designated as Top Value/Top Long Shot that finished in the top 5. Eight of the twelve Top Value/Top Long Shot horses finished in the Exacta with odds ranging from 11-1 to 30-1. Now that’s a lot of long shots! While the primary purpose of the Super Screener is to provide detailed race and horse-by-horse analysis, we also offer suggested wagers to select from to provide ideas on how to structure wagering strategies and potential tickets. These suggestions combined with your own convictions and betting preferences provide additional useful information to make for a successful experience at the races. Below is a summary of the return of suggested wagers across the Breeder’s Cup races. In the Juvenile Fillies Turf, all four of the Superfecta finishers were comprised of the Super Screener top 5 ranked horses for that race. In the Juvenile, the top 3 finishers were the top 3 ranked horses in the race by the Super Screener. Rushing Falls ran potentially one of the best races across the two days covering a lot of extra ground and then still showing a powerful surge of energy to easily prevail for the victory. Perhaps the heir apparent to Lady Eli in the Chad Brown barn? The jockey on top-ranked Super Screener pick in the Juvenile Turf, Masar, lost his irons after getting jostled into the far turn. Never really recovered after that losing all chance to the other Super Screener “A” horse and winner, Mendelsson. Bob Baffert’s Alluring Star was clearly 2nd best in the Juvenile fillies and is one to watch next year. She did all the hard work early in the race but held on tenaciously for second. The Turf Sprint and Filly and Mare Sprint both were place collapse races. In the Turf Sprint give extra credit to Bucchero and Pure Sensation who were part of the hot pace mix but held on well. In the Filly & Mare Sprint, Karen’s Princess and Unique Bella should both be highly regarded as the pace setters that faded but held on to mid-pack finishes. In the Turf Sprint race note that the top two finishers were local players with experience sprinting at Del Mar. This is a key screening criterion at any host track and one to keep in mind as the Breeders’ Cup moves to Churchill Downs next year. Another top Super Screener win pick that suffered trouble was Lady Eli in the Filly and Mare Turf. In the run down the chute on the Del Mar turf course, she got banged around by two rivals and suffered significant lacerations on both hind legs while losing the shoe from her left hind hoof. The injury she sustained, while not life threatening, was severe enough to prevent getting her on a plane headed to Kentucky as she was to go to sale. Instead, she gets a few more days of seaside air to recover. In the Mile race, a top Super Screener pick, Zelzel, also endured a tough trip running into a wall of horses as he was just winding up for a big run and then it was too late as he tried to re-rally on the rail. Don’t count Bolt d’Oro out of the Kentucky Derby running just yet. While he was no match for the winner (Top Super Screener pick, Good Magic), he ran about an extra football field running so wide throughout the race. Gun Runner validated once again what the Super Screener saw in this horse going all the way back to the Louisiana Derby leading up the to Kentucky Derby. This is a serious race horse that is only getting better. What made his Classic win even more impressive is the fact that it was a tough racing surface to win on the front end and he did so easily. He is the clear favorite now as they enter the Pegasus gate in January. 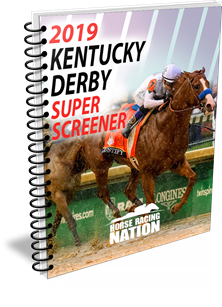 Order 2018 Breeders’ Cup Super Screener Now! ← Previous Story FREE DOWNLOAD – Breeders’ Cup Big Payoff Preview! First time subscriber and found the layout of every race extremely helpful and valuable. The wager strategy took a few races to understand a but managed to have a good day. Hitting the pick 4 was icing on the cake. Finally decided to take the plunge and try your service. I had a profitable day by hitting some nice exactas and the late Pick 4. I don’t think I would have had those 2 middle legs of the late P4 w/o your push. Well done. I would like to see more Pick 3, 4 and 6 suggestions and less emphasis on TRI./SUPER. Maybe some WIN bet suggestions and some dos and don’ts on final odds before making a play.